One of nature’s best health food which is a valuable source of omega 3 and dietary fiber is flax seed. Known for its nutritional benefits, which include lowering of cholesterol, protection against cancer and regulating of blood pressure, there is a growing popularity of flax seeds among the health conscious. I try to incorporate flax seeds into my family’s diet on a regular basis and relish it in a South Indian style avatar, Podi. 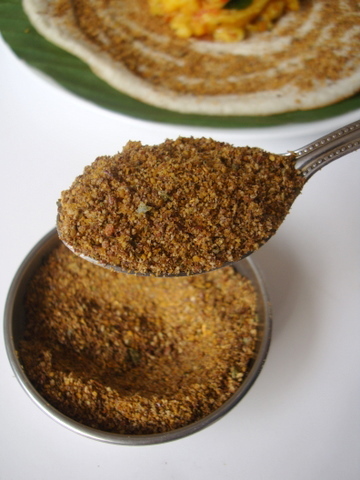 Makes for a delectable podi with idli, dosa, or with rice and a dollop of ghee. Flax Seeds go by the name Avise Ginjalu or Aviselu in Telugu and Alsi in Hindi. They are available at Fab India outlets and Nilgiris stores. 1 Drizzle oil in a heavy bottomed vessel and roast the channa dal on low to medium heat for 3-4 mts. Add split gram dal, coriander seeds, cumin seeds and dry red chillis to the roasting channa dal and continue to roast till the dals release their flavor and turn golden. Remove and cool. 2 In the same vessel, add the flax seeds and roast on low flame till they give a crackling sound like sesame seeds. Remove and keep aside. 3 In the same vessel, drizzle little oil and add the curry leaves and roast on low flame till crisp. Remove and keep aside. 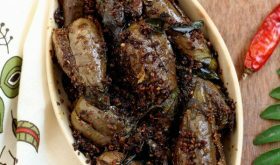 4 Place the cooled dals-spices mixture, curry leaves, flax seeds and salt in a blender and grind to make a coarse powder. Add the garlic towards the end and grind for a few seconds. 5 Store in an air tight container and place in refrigerator. Serve with tiffins like dosas and idlis with a generous helping of ghee or oil. There are many variations to this podi. One variation, add a small gooseberry sized tamarind to the above ingredients to get that tangy flavor. Add the tamarind at the time of grinding the ingredients. Another variation is to replace garlic with a little less than 1/4 tsp asafoetida. Always grind the ingredients only after they are completely cool, otherwise they will a form a lump and you will not achieve the desired powder consistency if ground when still hot. Always store in dry air tight bottles and use a dry spoon to remove the podi. Podis are best consumed within 3-4 weeks of preparation, as they don’t retain the freshness after a month or so. You can also refrigerate for a longer shelf life and freshness. Verry innovative and healthy too! Using flax seeds in podi is really good. Where are Flax seeds available in Vizag? At Fab India, Dutt Island, Siripuram. I do this podi without roasting the flax seeds . without frying can we grind the whole flaxseed and then eat? whether frying flaxseed is good or not? 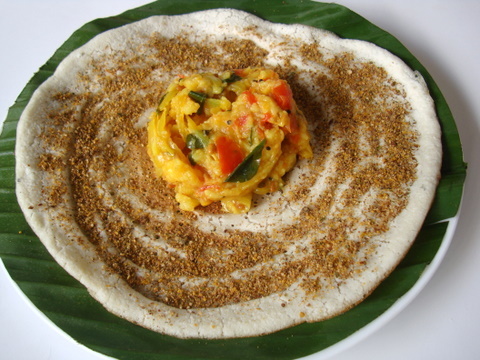 wow…nice podi recipe..flax seeds have many benefits indeed! Good recipe, but i heard from a couple of resources that too much flax is not good for children. Adults can benefit from its health properties. Thanks for another nutritious recipe !! Thanks for pointing out, Suma. Its 1 tsp of cumin seeds. wow lovely podi.. like it!! Do you know what its called in telugu? I have mentioned above in the post, Soumya garu. They are called Avise Ginjalu or Aviselu in Telugu. I think this nuvvula podi?.. u mean say Nuvvulu?? It looks delicious and flax seeds health benefits cannot be emphasized enough so it is really a great recipe. garlic, chilly pow and salt. I dont roast these seeds. Will definitely try this ver. Tried making eggless cake using curds and my daugh just loved it. Is cooking soda and baking soda the same? Yes, cooking soda and baking soda are one and the same. I made this powder y’day and it tastes good. I added sugar and tamarind.Thanks. Sailu! What a delightful recipe. Tried this and it takes exactly like my mother’s homemade karvepaku podi, except that this one is loaded with healthy omega-3’s from flaxseed. I would imagine this must be refrigerated though, since flaxseed (and flaxseed meal) is generally advised to be refrigerated. Great stuff! Hi I love ur site!Whenever i I’m bored of my usual recipes it is such a pleasure to get new ones from wonderful site blogs like yours.I have had a genreal question for sometime now that i think u will be able to answer. Why is it that when cooking with asafotida people say not to use garlic? Is it either one or the other, or can we use both in a recipe?If we should not use both, what is the reason for it? Basically asafoetida is a unique spice that elevates the flavor of spices and the rest of the ingredients called for in a particular recipe. When used along with garlic, the flavor of garlic overpowers asafoetida’s flavor. Brahmins since ages have been using asafoetida as a substitute for garlic and onions in their cooking. In a way asafoetida gives an aroma similar to garlic and hence there is usually no need to add both in a dish. This is my take on your question. Others are welcome to share their views on Leens query. Thanks Sailu. That does make sense. I tend to add garlic to food as much as possible due to the health benefits(and also to use it up)and often use both hing and garlic in dishes. When some aunties come to hear of it they respond as if I’m doing something totally horrendously wrong, but when I ask them what’s wrong with doing so, they don’t know the real answer, they just remember it as something one should not do. Again what you say makes sense, but I wonder due to their strong reaction, if using both has any unwanted or unhealthy effects. Is garlic expensive in India?Cause maybe they think it is wasteful to use both.If anyone out there knows about this or has a relative who might know please ask them and post cause this has been bugging me for some time.Thanks!!! Using both garlic and asafoetida in a recipe does not have any unhealthy effects. Garlic is not expensive here in India and people in low income groups use garlic in their everyday cooking. So am sure they do not consider it wasteful using both as they are used moderately in most recipes. garlic is a taboo or banned item in traditional orthodox brhamin families. one of the reasons is that when consumed the strong odour remains longtime and it repels the other people who sit next. there are many vegetarian foods like onion too banned in priestly class and used only as medicine when needed. since the rajassic or warrior like qualities are not expected in their diet, if right enquiry is made to right people they can enlighten on history ,reasons, logic , and applicability . Here senagapappu means is it chunty senagapappu? Senagapappu is Bengal gram/Channa dal. pls suggest. I also feel that flaxseed should not be heated at all. and this should be stored in a opaque container in freezer for preserving and longevity say for a month”s use. really very tasty recipe,would like to try but few questions. 1–Which type of flax seeds should use (means brown in color or yellow Golden in color),also health point of view. 2–the dal used in recipe was already cooked or just raw,if it was not cooked then is it safe to eat it and will easily digested,What if i used a cooked dal (remaind hard but cookes a little). Brown flax seeds. If you read the recipe carefully, its mentioned that the dal should be roasted. You do not cook the dal but roast it in a little oil. When you grind the dal, it will become a fine powder. Thanks for this recipe. It is very delicious. Although my podi did not turn a darkish color like yours, maybe it is due to the fact that I used flaxseed powder instead of flaxseed. Thanks again. Under ingredients, you have mentioned 2 tbsps cup black gram dal/minappapu and while explaining the method you have said split gram dal. Which one is correct? How much is the measurement for black gram dhal not clear in the ingredients list. Is it 2 tbsp or cup? Flax seed once powdered has to be refrigerated… Otherwise it looses it’s nutritive value. Thanks for the recipe.